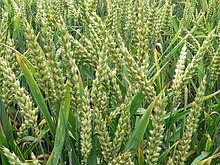 Is There a Place for Wheat in Your Garden? The last time I wrote about home-scale wheat growing, I referred in passing to other crops occupying the same ground at the same time. Let’s go there first. Part I: Types of Wheat, Weed Control, Planting – I’ve always considered it prudent to be able to produce my own grain right in my own backyard. It’s all very well to grow one’s own mesclun and salsa ingredients, but the basis for most of our diets, going back thousands of years, has been grain in some form. There may be more profit in zucchini and basil, but there is more security in wheat.